Ohio Alleycat Resource and Spay/Neuter Clinic has been spreading joy to retirement communities with its PALS program. PALS (Pet Adoptions for Loving Seniors) is designed to find loving homes for older cats. 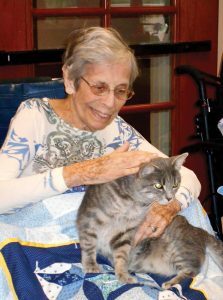 Senior cats often are overlooked because of their age, but they can make great companions for senior citizens. With a caravan of volunteers and cats in tow, OAR has been visiting communities – including Maple Knoll Village and Marjorie P. Lee Retirement Community – sharing OAR’s mission and discussing the benefits of adopting older cats. The visits also include a discussion of Cats in Hollywood and a snuggle session for a purrfect ending. ← Forget politics. What about Bob Ross?